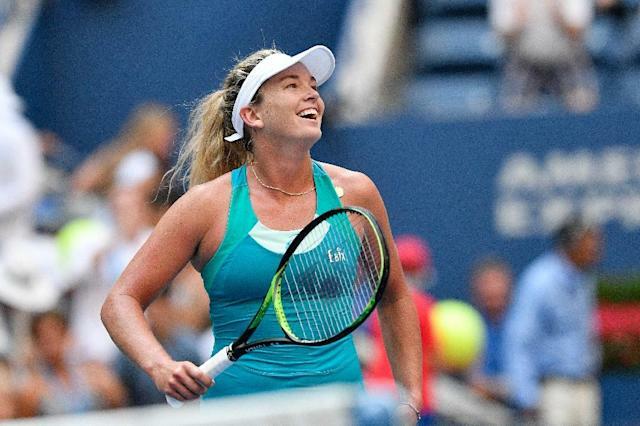 New York (AFP) - When CoCo Vandeweghe says she's trying to become the best athlete in her family as well as a US Open champion, it's more impressive company than one might imagine. There's her Olympic swimmer mother Tauna, the NBA trio of her uncle Kiki, grandpa Ernie and great-uncle Mel plus ex-beach volleyball pro uncle Bruk and aunt Heather, the US polo team captain. "My grandfather always said he was the best athlete in the family. So we're all trying to live up to him," Vandeweghe said. The 25-year-old American served notice Monday she might outshine all, reaching her first US Open quarter-final by defeating 37th-ranked Czech Lucie Safarova 6-4, 7-6 (7/2). US 20th seed Vandeweghe, an Australian Open semi-finalist in January, will face Czech world number one Karoline Pliskova on Wednesday for a berth in the semi-finals. And it might just be some advice and discipline instilled in CoCo by her grandfather that helps her upset the top-ranked star to match her best Slam run. He was a fan of the "Pyramid of Success" philosophy of John Wooden, the legendary college basketball coach at the University of California at Los Angeles (UCLA) just before uncle Kiki began a four-year star run there. "You have to build from the bottom up," CoCo recalled. "I've had it in my bathroom since I can remember, so I'm very familiar with it. I spent a lot of time under that kind of protocol of where you start. "A great example of that is my grandfather was always very particular using that 'Pyramid of Success' to start from just putting your socks on correctly without any bumps, because that gives you blisters. "As a kid you don't care. You just want to go and play and get started. Even though your friends are already out there shooting or kicking the soccer ball or whatever, it was more about getting the little things right." CoCo was excited that uncle Kiki, an NBA executive who played 14 league seasons, came to watch her Monday. "I need all the encouragement I can get," CoCo said. "I'm trying to catch up to my grandfather to be the best athlete in the family." CoCo has already helped the United States land three women in the US Open last eight for the first time since 2004 along with ninth seed Venus Williams and Sloane Stephens. "Maybe the NBA offices can let him off for a few days," CoCo said. After all, being a Grand Slam title winner would impress in a family where standing out is tough. Vandeweghe, playing in her hometown, is the daughter of 1976 US Olympic semi-final backstroker Tauna Vandeweghe. Her mother's parents were 1952 Miss America beauty pageant queen Colleen Kay Hutchins and former New York Knicks basketball player Ernie Vandeweghe. Ernie, who died in 2014 at age 86, was a swingman for the NBA New York Knicks from 1949 to 1956, helping them reach three NBA Finals. Kiki was a forward from 1980-1993 for Denver, Portland, the Knicks and Los Angeles Clippers becoming a coach and and general manager. CoCo's grandmother's brother, Mel Hutchins, now 88, played power forward from 1951-1958 for the Knicks, Milwaukee Hawks and Fort Wayne Pistons. Four-time NBA All-Star Hutchins helped the Pistons to the 1955 and 1956 NBA Finals.